For those who would prefer simply to read the commentary, however, or for anyone having difficulty using the viewer, I’ve reposted the game below. One advantage is that you can see diagrams in the positions where Shipov included them. At the end of the text I’ve also embedded his video round-up of the game. Hello, dear friends! This is Grandmaster Sergey Shipov commentating on the penultimate game of the World Championship match for you. The score’s still level and the stakes are incredibly high. The cost of each potential mistake is hundreds of thousands of euros and the title. 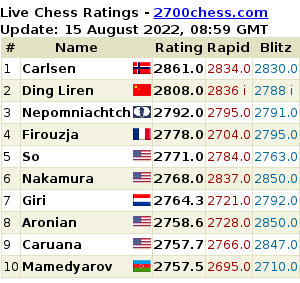 Can you imagine what’s going on inside Boris Gelfand just now? Inside a man who’s never played such crucial games before and who’s never been so close to the chess Everest… I can, if only in miniature. Here what’s important is the contrast between the stakes that had existed before and those that are being played for now. I remember my first knockout World Championship in Las Vegas in 1999. At stake were sums which were an order of magnitude higher than those in my tournaments before then. Plus there was also the beckoning mirage of fame. So then, before the games I was literally a wreck [Shipov uses a colloquial Russian verb derived from “sausage”] – a culinary term, not a literary one, but it accurately reflects the essence of the phenomenon. I wasn’t myself. I couldn’t sleep calmly, or eat, or think about anything else. It was a real fever… And lots of the Russian players I encountered were in the same state when they found themselves in that new tournament for the first time. And now if you multiply all I’ve said by a factor of ten – you’ll get a vague idea of the whole weight that’s landed on Gelfand now. Of course, all of us dream of ending up in his position and fighting for the title, but on the other hand, the one described above, you wouldn’t envy him now. Will Boris withstand it without cracking? The games will show… There are only minutes left until the eleventh encounter begins. We expect the Nimzowitsch Defence and a fierce struggle. 1.d4 Nf6 2.c4 e6 3.Nc3 Bb4 Yes, correct. The Nimzowitsch Defence. 4.e3 Again the Rubinstein System. 7.O-O dxc4 8.Bxc4 Bd7 But this is a local surprise! I’ve seen people bring out the queen’s knight to the d7-square, but the bishop… The move is, of course, a developing one, as the knight will later come to c6. Although other variations are also possible. Gelfand is, naturally, puzzled – he’s carefully studying the position that’s arisen. He’s remembering… In actual fact the move has been seen more than a hundred times, starting from the middle of the last century. Its instigator was David Bronstein, while in the new century it’s often been played by another outstanding offspring of the post-war Soviet Union – Viktor Korchnoi. You might say it’s the fashion of the 50s. The virtue of Black’s manoeuvre is that it’s only the sixth most popular. So for those who are playing White, including Gelfand, it’s not the first thing they prepare for… Vladimir Kramnik, who’s commentating on the official website, is using the long pause to talk about how chess players recover and maintain themselves during a game. He says you need to drink fruit juice and eat fruit and chocolate, supposedly to maintain the correct blood sugar level. Personally I preferred chocolate. Our Soviet chocolate. For example, “Vdokhnovenie” [“Inspiration”]. I recommend it! Meanwhile Anand has grown tired of waiting for his opponent’s reply – he’s left the stage. It’s a pity he’s unlikely to enter the commentary booth, as after all he might be able to add something of interest! The absence of Anand sitting opposite him isn’t helping Boris either. He’s behaving extremely nervously at the board, simply unable to take a decision. He’s clearly struggling with himself just now, almost without thinking seriously about the position… The burden is weighing on him more and more, while time is slipping away. Half an hour has already passed. Boris, pull yourself together! It’s time to play chess. White’s got a big choice: 9.a3, 9.Qe2, 9. Bd3, 9.Bd2, 9.h3 and lord knows what else. I suspect Gelfand is choosing between the first two options. When he’s not lost in introspection. 9.a3 Probably the most logical and ambitious move. Black also has a choice, by the way. 9…Ba5 As I was saying. 10.Qe2 The correct choice. 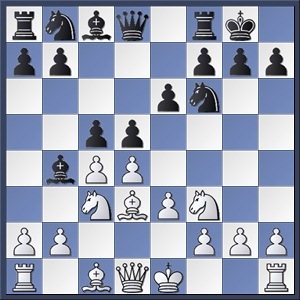 White is developing according to a known pattern with the inclusion of the moves a2-a3 and Bb4-a5. Who will that favour? That’s the suspense in this line. 10…Bc6 Yes, such a rearrangement of Black’s minor pieces is now considered almost obligatory here. 11.Rd1 The pressure from the rook can’t be ignored. The d4-d5 break might also be an option in some cases. 11…Bxc3 A novelty in the given concrete situation, but the exchange itself is banal. 13.Bd3 Boris is preparing to advance pawns in the centre. His bishops [elephants in Russian!] are kicking their hooves, yearning for space! Following the example of Artur Mayakovich and putting the light-squared “hoofed one” on b3, in the absence of a pawn on a2, would make no sense – the unstable position of the white pieces would be fraught with danger. 13…Qa5 Vishy is beginning to pester his opponent’s weaknesses on the queenside. In principle, it’s turned out that Black has completed his development first. He needs to extract some real fruits from that temporary advantage, as otherwise he won’t manage to equalise. The contrast in time spent is becoming ever more pronounced: 1:02 – 1:55. Anand’s got almost an hour to spare! 14.c4 Again keeping the bishop on c1. Cunningly played! I suspect the Champion will finally start to think. 14…cxd4 A critical decision. Play is opening up and the c1-bishop will become powerful. 15…Qh5 There it is, the foreseen switch of the queen to the kingside. Does it seem as though Black’s threatening to double pawns on f3? Personally, I don’t think it’s a real threat. Two bishops against two knights… for the third time in a row in the match – that would be interesting! And dangerous for Black. In such an open and dynamic position the knights are clearly weaker. 16.Bf4 Correct! 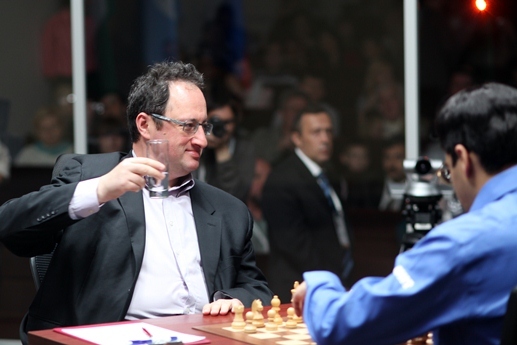 Gelfand calmly completes his development. The activity of his pieces compensates for the potential structural weaknesses. 16…Rac8 Anand is placing his pieces attractively, although it’s not yet clear what he should do next. The time gap isn’t narrowing: 0:42 – 1:40. Time trouble is close, but only for one of the match participants… It seems he’s now deciding where to move the f3-knight – to e5 or d2? From the point of view of simplifications and a draw the first would be more reliable. From the point of view of maintaining the suspense the second is better. A third path probably isn’t bad either – 17.a4 and then 18.a5. Having a wide choice isn’t always a good thing, my friends. You’re beset by constant doubts and a lot of time and effort goes nowhere. 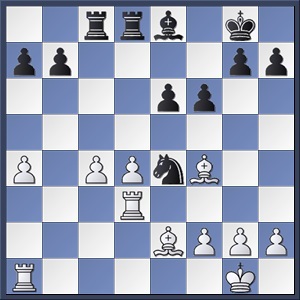 17.Ne5 In practical terms Gelfand’s choice is understandable. With so much less time he decided not to take a risk. The position that’s arisen is a little better for White, but Black has a huge safety margin. 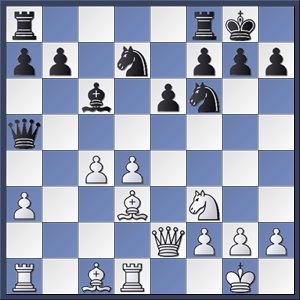 For a real struggle for victory White lacks a pair of knights on the board – that pair which was just exchanged. Without the joker-knight it’s hard to pose his opponent practical difficulties. It’s not easy to create new weaknesses. 20.a4 The good thing about the position for Boris, apart from the advantage of the two bishops, is that it’s extremely difficult, if not impossible, to make a serious blunder. There are obvious useful manoeuvres and no problems at all. 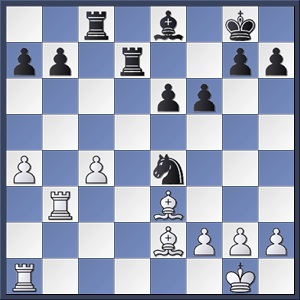 It looks obvious to play a4-a5, f2-f3, Kg1-f2 and then it’ll be clear what you should undertake next. 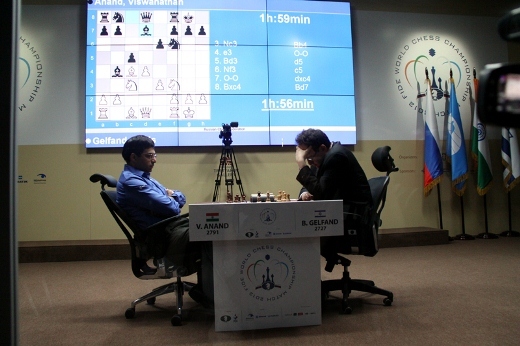 However, Black isn’t obliged to stand and wait… For almost the first time in the game Vishy is having a serious think. It’s not hard to predict his move – I’d say it’s a 90% likelihood that his knight will be set in motion. 20…Ne4 There it is. A cultured chess player isn’t going to wait around to be completely squeezed. The knight’s threatening to come to c3, and if White plays Ra1-a3 he has to deal with a blow on a4 – either immediately, or after including the move f7-f6. 21.Rd3 This looks unattractive, but it’s functional. 21…f6 By chasing away the enemy bishop Black is weakening the d4-point and, perhaps, preparing the cunning switch Bc6-e8-g6. Strangely enough, the struggle is still extremely concrete and fierce. 22.Bf4 The only move. If the dark-squared bishop was exchanged for the knight White would end up on the defensive. As expected. This isn’t the only continuation, but it’s the most logical one. No-one is any longer interfering with the rooks putting pressure on the white pawns. A capture is threatened on c4, and so far I can’t come up with anything other than c4-c5. However, each pawn advance in the centre carries a strategic risk. Food for thought, but there’s no longer any time to have a serious think: 0:26 – 1:08. 23.Rb3 It’s obvious the Challenger is striving to avoid complex, calculating play – which makes sense, given Boris really is in time trouble now. He’s nervous, and he doesn’t trust his calculations. 23…Rxd4 24.Be3 The position is being unloaded. Exchanges bring us closer to a peaceful outcome. 24…Rd7 Of course you couldn’t give up the b7-pawn. At this point the players AGREED A DRAW. There might have followed: 24…Rd7 25.Bxa7 Nc5 (it doesn’t do any good to play 25…Rd2 because of 26.Kf1! with the idea of f2-f3) 26.Rb2 Nd3 27.Bxd3 Rxd3 28.Rxb7 Bxa4 29.Rb4 (29.Rxa4? 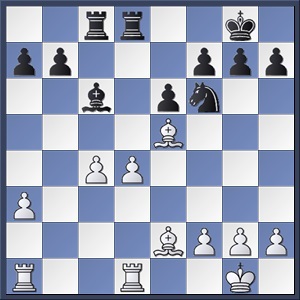 Rd1#) 29…Bc6 30.Be3, after which the peaceful outcome of the battle would be even more obvious. The lack of time came back to haunt Gelfand on move 17, when Shipov felt 17.Nd2! would have retained winning chances. By the end, however, it was Anand who had the more realistic prospects, and Shipov said than in the Champion’s place many would have tried to exploit Gelfand’s time trouble with 24…Nc5!?. He thought only Black could be on top in the ensuing positions. Teh english transalation lost so much vigor and funny language used by Shipov, no fun reading the English commentary. Feel sorry for all those who couldn’t hear Shipov’s commentary. What more do we need now to spot the bias in Shipov?. But why should he be biased of all the people? I did not enjoy this sheer absence of neutral tone in every single game in Shipov narratives. Maybe others dont see it the way I do; Shipov’s choice of text & tone is dissing the world champion way too much. I like both Boris and Anand as true gentlemen, worthy of being here by the sheer dint of what they continue to achieve in chess world. And will continue to read Shipov – Do still look forward to a more balanced analysis for 12th game.